You will find FDC & Stamps collection in my blog.FDC were sent by my friends from different parts of world.Selective FDCs are displayed here starting from 2007. The convention was developed and adopted by participating nations at a meeting in Ramsar, Mazandaran, Iran, on February 2, 1971, hosted by the Iranian Department of Environment, and came into force on December 21, 1975. The Ramsar List of Wetlands of International Importance now includes 2186 Sites (known as Ramsar Sites) covering over 200,000,000 ha (490,000,000 acres). The country with the highest number of Sites is the United Kingdom at 170 and the country with the greatest area of listed wetlands is Bolivia, with over 140,000 km2 (54,000 sq mi).The Ramsar definition of wetlands is fairly wide, including "areas of marine water the depth of which at low tide does not exceed six meters" as well as fish ponds, rice paddies and salt pans. Presently there are 168 contracting parties, up from 21 initial signatory nations in 1971. The state parties meet every three years as the Conference of the Contracting Parties (COP), the first held in Cagliari, Italy in 1980. Amendments to the original convention have been agreed to in Paris (in 1982) and Regina (in 1987). 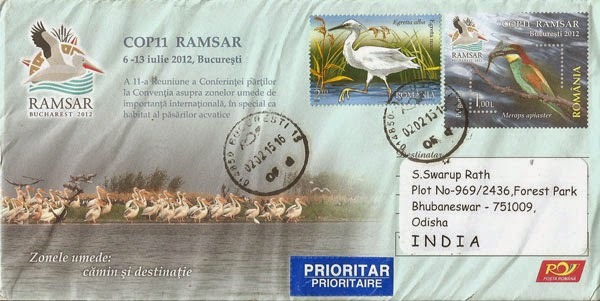 Romania has seven Ramsar sites. Hi it was very informative post. Thank you for sharing this information. In this era of emailing and texting, a handwritten letter has become outdated but it is one of the most classic ways of expression. The common question that arises at the time of mailing a letter is how many stamps do I need to send a letter?